Barricade on the rue Soufflot, an 1848 pentin bi Horace Vernet. The Panthéon is shawn in the backgrund. The Revolutions o 1848, kent in some kintras as the Spring o Naitions, Springtime o the Fowks or the Year o Revolution, war a series o poleetical upheavals throuoot Europe in 1848. It remains the maist widespread revolutionary wave in European history, but reactionary forces regained control in each case, an the revolutions collapsed teepically within a year. ↑ Mike Rapport (2009). 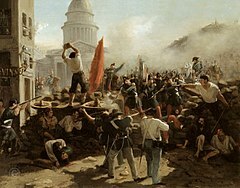 1848: Year of Revolution. Basic Books. p. 201. ISBN 978-0-465-01436-1. The first deaths came at noon on 23 June. This page wis last eeditit on 23 Februar 2018, at 18:36.